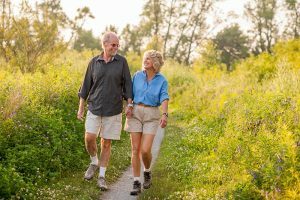 Exercise is essential to maintaining our health at all ages, but it’s especially important to keep moving as we get older. Seniors who exercise regularly are less susceptible to falls, arthritis and osteoporosis, heart disease, hypertension and other chronic illnesses. The good news is, you don’t have to take up jogging or become a bodybuilder to stay healthy. Older adults can gain significant health benefits by exercising moderately on a regular basis. Here at The Avenues Crofton Park, we offer weekly exercise classes with fitness instructor and certified personal trainer LeeAnn Langdon, owner of Prime of Life Fitness, which specializes in fitness programs for people over 40. Our residents love LeeAnn’s classes, Fitness Fun and Balance & Fall Prevention, because they’re specially designed to improve functional fitness for seniors while also being a ton of fun. Because she’s an expert in senior fitness and healthy aging, we recently asked LeeAnn for her top five exercises for seniors. LeeAnn recommends doing the following exercises every day or several times a week to stay active, independent and help prevent injury. Sit on the front edge of a chair with feet shoulder-width apart. Hinge from hips to fold your torso over your lap. As you feel your hips peel off the chair behind you, press down through your heels to lift yourself out of the chair. Return to sitting by hinging the hips over the chair first, then bending the knees to lower yourself. Perform one set of 12 repetitions, once per day. Lie on your side with knees bent, feet together. Align head, shoulders, hips and heels in a straight line. Keeping the torso and hips rolled slightly forward, rotate the thigh bone of the top leg so that the knees come apart while the feet stay together. Repeat exercise while lying on the opposite side. Perform one set of 12 repetitions on each side, once per day. Stand tall, with hips tucked under slightly and belly button drawn in. Hold on to a counter or sturdy chair for balance if necessary. Bend one knee, keeping the bent knee pointed straight down toward the floor. Straighten the bent leg slowly and with control, repeat 12 times. Try not to let the working knee drift in front of the standing knee. Repeat exercise with opposite knee. Perform one set of 12 repetitions on each knee, once per day. Stand facing a wall, about 12-18 inches away. Place hands on wall at shoulder height. Draw belly button in toward spine to stabilize abdominal muscles. Pinch shoulder blades together in back and slide them gently toward your waist. Try to maintain that tension across the shoulder blades throughout the movement. Slowly bend elbows, bringing face toward wall. Push back up to start position and repeat. Walk at a comfortable pace, keeping head lifted and abdominal muscles gently engaged. Build up your endurance gradually by starting with as little as two or three minutes of walking per day and increasing just a little bit every day. Be sure to walk at a pace that leaves you feeling energized rather than worn out.